Thank you for your continued loyalty to our great community. Without you all this would not be a home . Well deserved promotions! As Warrant officer you have chosen the path to continue leading in our community. Your commitment and dedication is very appreciated. Join us for Drunken Battle Friday tonight! CS:GO @ 9:00PM EST - This week India Company will be playing Counterstrike! Follow the link below to enter the India raffle. PUBG @ 9:00PM EST - This week Shadow will be playing PUBg. Stop by link below to enter the Shadow raffle. THE DIVISION 2 @ 9:00PM EST - This week Vanguard will be playing The Division 2! Stop by link below to join the conversation and to enter the Vanguard raffle. In case of ties for closest to number, lowest number wins. Remembering Mike - We lost a member this week and Zulu will be hosting a DBF to remember Mike. If you can make it this DBF, stop by and show your support! "To live in hearts we leave behind is not to die." ROCKET LEAGUE @ 9:00PM EST - This week India Company will be playing Rocket League, stop by and check it out! Follow the link below to enter the India raffle. REMEMBERING MIKE @ 9:00PM EST - This week Shadow will be joining Zulu in their DBF to remember Mike. Stop by link below to enter the Shadow raffle. IN REMEMBRANCE OF MIKE @ 9:00PM EST - We lost one of our own this week, keep your thoughts with Mike's family and friends and celebrate his memory this Friday with Zulu Co. Zulu will be hosting a DBF playing the games Mike enjoyed and to the extent possible, playing them Mike's way! PUBG - NEW STUFF @ 9:00PM EST - This week Shadow will be playing PUBG and checking out the new weapons and loadouts! Stop by link below to join the conversation and to enter the Shadow raffle. RAINBOW 6: SIEGE @ 9:00PM EST - This week Vanguard will be playing R6s! Stop by link below to join the conversation and to enter the Vanguard raffle. 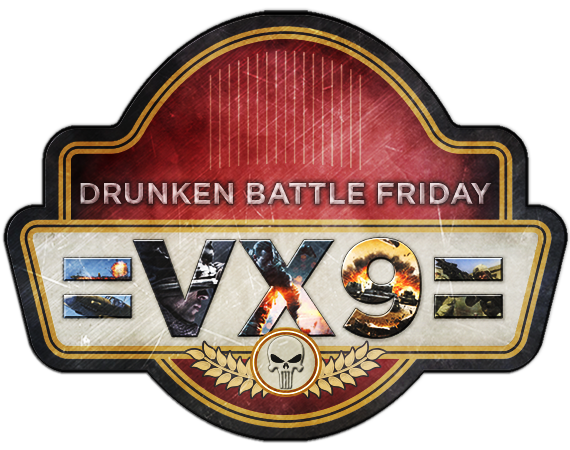 Join us for Drunken Battle Friday! Start Spring right with some DBF action! APEX LEGENDS @ 9:00PM EST - This week Shadow will be playing Apex Legends! Stop by link below to join the conversation and to enter the Shadow raffle. THE DIVISION 2 @ 9:00PM EST - This week Vanguard will be heading back out into DC, so tweak your kit for this weeks adventures! Stop by link below to join the conversation and to enter the Vanguard raffle. Each winner will receive 50 OTC! You can only win one time and I will be matching numbers in order you post them and matching those in order, to the random numbers I generate. In case of ties, lowest number wins.